As a firm, Liskow & Lewis embraces the sentiment reflected in Justice Brandeis’ comment as well as the American Bar Association’s exhortation “to provide legal services to those unable to pay.” We believe pro bono work is a professional responsibility and essential in order to advance the legal standing of diverse and historically underserved populations. To this end, the firm fosters an environment in which individual lawyers are encouraged to embrace this responsibility through pro bono work. Not only do these efforts contribute to the fabric of our communities; pro bono initiatives provide rich experience for our associates, enhancing a personal professional framework, as well as helping to equip them for service to our clients. The firm is an active participant in the Pro Bono Project, an organization which acts as a central coordinator of services to those in need. Additional matters are brought into the firm by individual attorneys, referrals from neighborhood clinics and referrals from the public and indigent defender offices. Specific matters in which our lawyers are engaged vary widely, reflecting the differing interests and expertise of our people. The firm has long been a leading participant in United States District Judge Jay Zainey’s incredible pro bono project called HELP. The program organizes law firms to handle legal consultation services at homeless shelters in the New Orleans area. Liskow covers the month of November to provide free legal advice and other legal services to the homeless community. 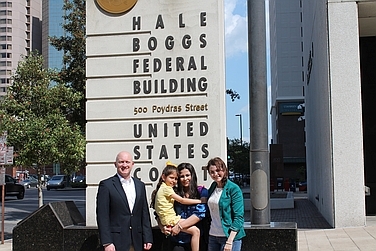 Appointment from federal judges involving the Hague Convention on international child abduction and custody disputes. Trial of a maritime dispute in federal court involving the theft of a vessel. Landlord/tenant advice on a pro bono basis. Four contested guardianship proceedings resulting in our clients being appointed the guardians of their orphaned nieces and nephews. A dispute concerning shoddy elevation of the client’s home. Civil case on behalf of a woman whose home was damaged by faulty renovation work done by an unlicensed contractor. Paternity suit in Orleans Parish. Legal advice to Trinity Episcopal School and general advice to Trinity Episcopal Church in New Orleans. Representation of unaccompanied juvenile in deportation proceedings.